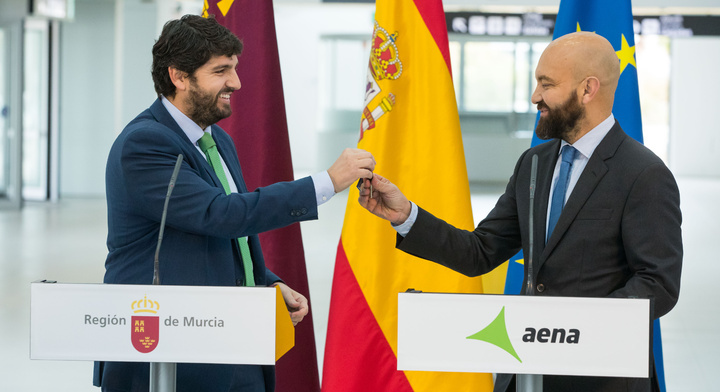 On Saturday morning Jaimie García-Legaz formally signed the contract for the operation and maintenance of Corvera Airport for a term of 25 years alongside Murcia’s President, Fernando López Miras. López Miras also confirmed that the airport will be named after Juan de la Cierva, the inventor of the autogyro. ON signing the contract AENA President, Jaime García-Legaz, said that the airport will be ready to operate from December. However, the specific timing of the commencement of flights will depend on the airlines, although he believes that it will not be beyond that date. The process of certification of facilities and controls by the State Security Agency will get underway today, Monday, and will take several months, although during this period, a plan to attract the interest of airlines will be initiated in parallel. It is also understood that Corvera will generate more jobs than San Javier, and will function for longer hours, mainly because its operations will no longer be limited by the military. The airport will have capacity to accommodate about 4 million passengers a year, figures that will strengthen the tourism and economic growth of the Murcia community. Not going to happen. They can posture all they like. Irregardless of the quoted months of bureaucratic shenanigans, the air field systems are out of date. None of the tech is future proofed ; it’s been switched off, unmaintained and sweating through umpteen summers with no air conditioning. It will all have to replaced or refurbished at astronomical cost. I did this for a living and critical airworthiness systems are very sensitive beasts, even when they are operational. The airport infrastructure will have to pass new stringency tests by licensed inspectors again at astronomical cost. Can Murcia afford to cut off its nose to spite its face ? The bookies are now taking bets, surely that’s an indicator ? I have €200 at 15/2 the “Airport won’t open in 2018”. Sorry homeowners up there, you bought a pup.